All the flavors of a steakhouse dinner in one delicious bowl, without the carbs. 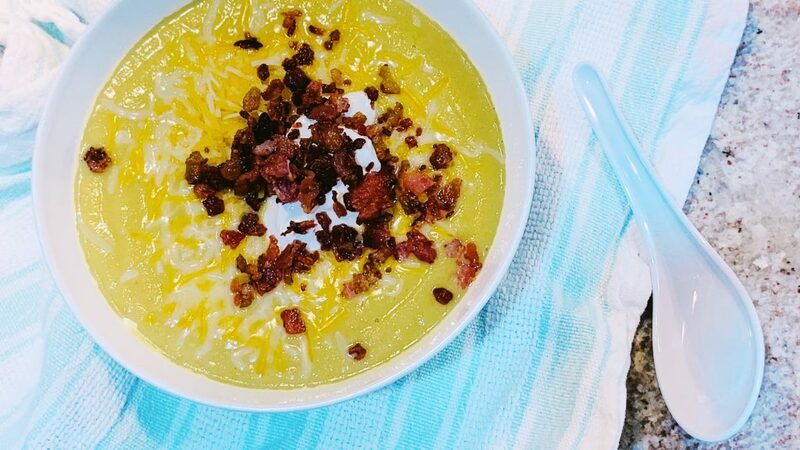 Keto Loaded Cauliflower Soup is an easy prep meal for the whole family. I enjoy a good steakhouse meal, perfectly cooked steak and a loaded baked potato on the side. Growing up I would eat baked potatoes as often as I could, and in college a baked potato made for a great meal. 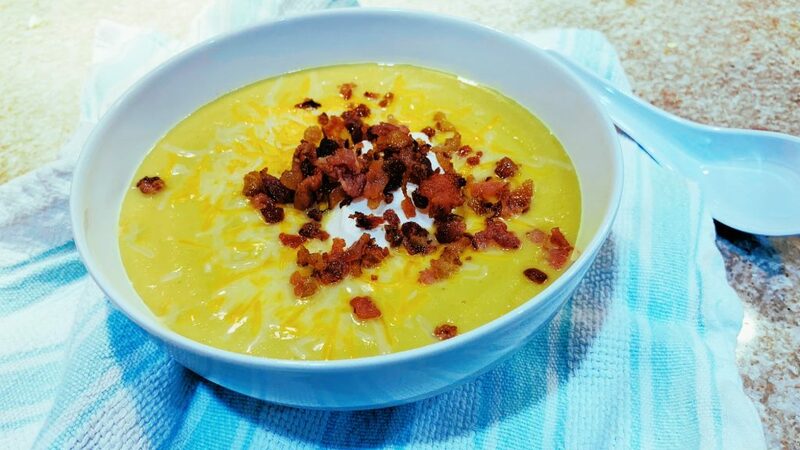 My mom also makes a baked potato soup that has all my favorite loaded flavors. 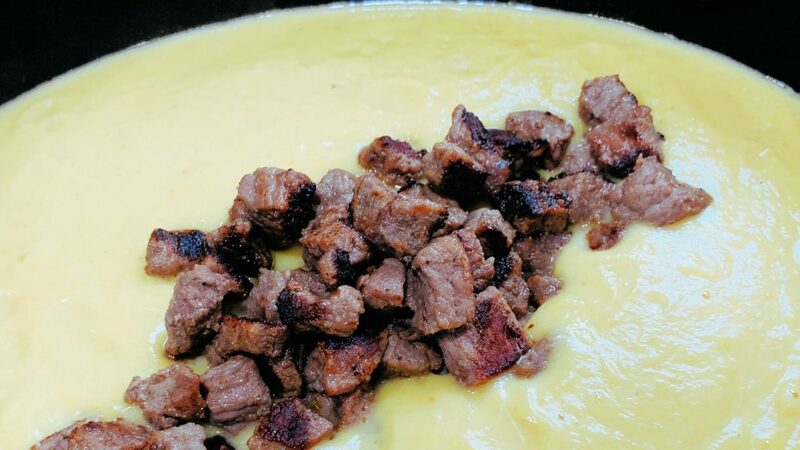 This Loaded Cauliflower Soup satisfies all the steak and potato cravings, and you won’t miss the carbs. The first time I made this soup, I actually didn’t include the steak. So if you don’t want the steak, Loaded Cauliflower Soup is great without it too. The steak was my husband’s idea, to take the soup to the next level. I cooked the steak, added it to the pureed soup, and let the soup continue to cook for a couple hours. This way the steak flavors enhance the rest of the soup. I cooked the steak right before adding it. However, you can always cook up the steak when you’re prepping the vegetables or right before serving. Just make sure you blend the soup before adding the steak. Making Keto Loaded Cauliflower Soup is pretty simple. 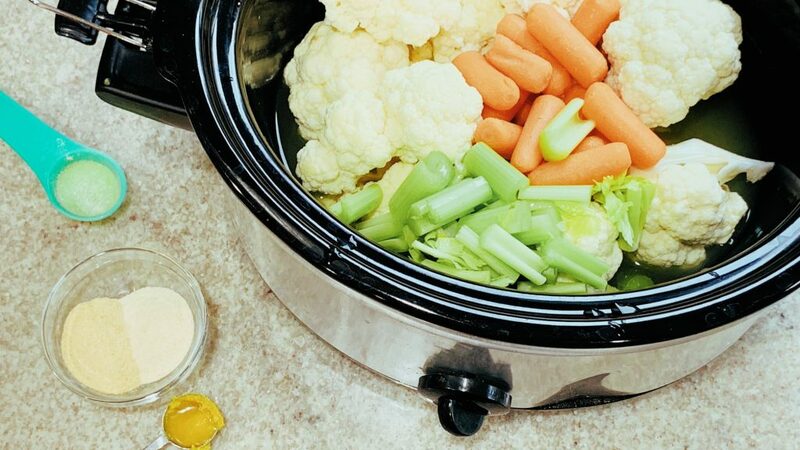 Just fill up your slow cooker with cauliflower florets, baby carrots, chopped celery, chicken stock and spices. Then, let the veggies cook on high for 4-5 hours or on low for 8-10 hours. Once the vegetables are tender, add in heavy cream and blend with an immersion blender. Next, cut up the steak into 1/2″ pieces, season the pieces, and sauté in butter. Cook the steak when you’re prepping vegetables or later as time permits. Add the steak to the soup after you puree it. If possible, give the steak time to simmer with the soup, so all the flavors can meld together. 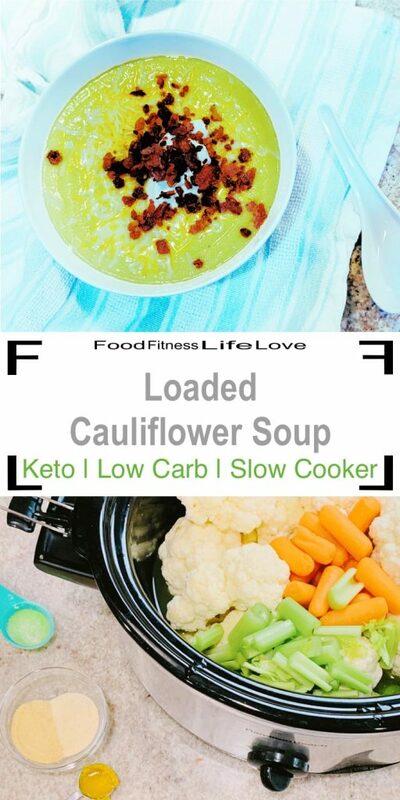 When it’s time to eat, serve the Keto Loaded Cauliflower Soup in bowls and top with your favorite loaded toppings. We like shredded cheese, bacon, and sour cream. Green onions or chives would taste great too. Cut up the cauliflower into florets and chop the celery into pieces. Add the cauliflower florets, chopped celery, and carrots to the slow cooker along with chicken stock, 3 tsp garlic powder, onion powder, 2 teaspoon season salt, bullion and parsley flakes. Turn the slow cooker on low for 4-5 hours or high for 8-10 hours. About halfway through cooking (2 or 4 hours respectively) all the vegetables should be tender. 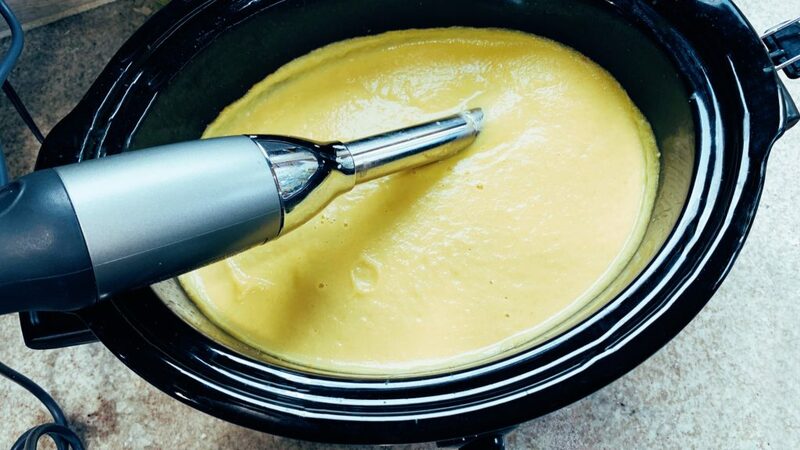 Add the heavy cream to the slow cooker and puree the soup with an immersion blender. Heat the butter in a skillet over med-high heat. 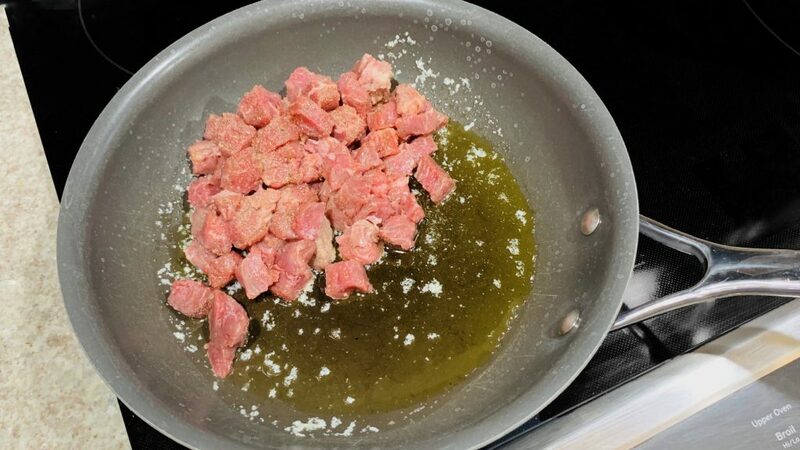 Cut up the steak into 1/2″ cubes and season with season salt and garlic powder. Fry up the steak in the butter, and then add it to the crockpot. Continue to let the soup slow cook until you’re ready to eat. 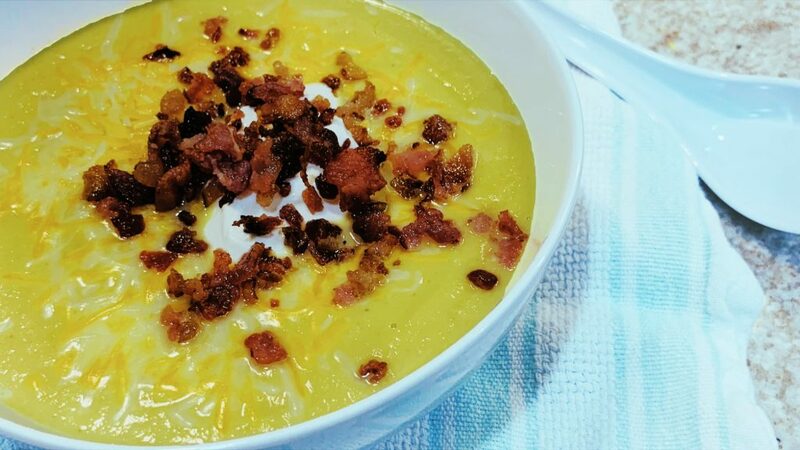 Serve the loaded cauliflower chowder with bacon, shredded cheese, and sour cream as desired and enjoy.